"The morning's gonna shine like a red rubber ball"
I had a great day off with my wife, Ann, even though some of it was taken up by an appointment with our dentist. The highlight of that visit came when the doctor and I sang some of 'Red Rubber Ball' by the Cyrkle to his hygienist. She hadn't believed him when he mentioned this song and the band; she thought he was making both names up. Kids! (She's thirty.) I had to sing to vouch for his veracity. By the way, the Cyrkle, an American band, was managed by Brian Epstein, the manager of the Beatles. They opened for the Beatles on what I think was their last tour of the US, in 1966. 'Red Rubber Ball' was co-written by Paul Simon, a melodic little pop tune that, as you can hear in the clip below, lent itself to pleasant harmonization. When you give charity to the poor, don’t make a show of it. When you pray in public, don’t pile phrases one on top of the other in order to wow the people around you. And when you fast—that is, give up food for a time, don’t let your outward appearance call attention to your “sacrificial” religious devotion. Spiritual disciplines are meant to draw us closer to Christ, deeper into His orbit, and to create habits of dependence on God within us. When we give, we’re trusting God to keep providing for our needs even though we have less. When we pray, whether publicly or privately, we’re acknowledging our complete dependence on God and not ourselves. Spiritual disciplines aren’t meant to give us bragging rights, so that we can show the world how faithful we are. All of that is easy enough to understand. It’s easy to understand too, when Jesus says that those who make shows of their acts of religious piety get the very shallow, meaningless rewards they seek: People notice them. But the notice of people, the applause of the crowd, won’t get us what only Jesus, Who bled and died and rose again for us, gives. To those who turn from sin and entrust their lives to Him, Jesus gives the only rewards that last after the cheering has stopped, after the crowds have turned away. Those rewards include forgiveness of sin, eternal life with God, and purposefulness for the living of these days. Don’t forfeit the only reward worth having, Jesus is telling us in tonight’s Gospel lesson, by allowing your life with God to boil down to things you do for show. The fact is that what people think of us doesn’t matter. Jesus commands us to play to an audience of One. The opinion Jesus Christ has of our beliefs and motives is the only opinion that will count on judgment day, when He will return to the world to judge, as we say in the Creed, "the living and the dead." The apostle Paul knew all of this. The first century church of Corinth that he founded, after a time, became a dysfunctional mess requiring him to send at least two letters of correction, both of which the Holy Spirit has inspired the Church to include in the New Testament portion of the Bible. One dispute among many that existed in the Corinthian church was between those who liked the teaching of Paul and those who preferred that of a preacher who came along after Paul left Corinth, named Apollos. Paul wrote to say that such arguments were silly. Paul hadn’t died for their sins and Apollos hadn’t risen from the dead for them. Only Jesus could save them, Paul reminded them. Don’t worry about showing others what a good Christian you are; just be a Christian. Don’t call attention to your acts of Christian devotion; just be devoted to Christ. We could end the sermon right there, I suppose. But, as Lutherans, we believe that we can’t just take pieces of Scripture and leave them as isolated proof texts for the hobbyhorse of the day. Martin Luther said that we should let Scripture interpret Scripture. In other words, a single verse of Scripture, without consideration of the witness of the whole Bible, can be used or misused to say anything. Do that enough with single passages of scripture and you distort the whole Bible and the entire Christian faith. These are great words for us to remember as we begin the season of Lent. I knew a guy who gave up all sweets during Lent. He seemed to tell everybody he knew that he had given up sweets for Lent. “Want a cookie?” someone would ask him. “No,” he’d say, “I gave up sweets for Lent.” “Want a piece of cake?” Same answer. “Want a can of pop?” Same answer. The first twenty or so times he said, “No, I gave up sweets for Lent,” the response was predictable. People applauded him for his discipline and self-sacrifice and altogether upright behavior. He basked in their compliments. But after a time, people quit asking him if he’d like a cookie, a piece of cake or candy, or a can of pop. Without these offers and the opportunities they gave him to brag about his Lenten discipline, he found it harder and harder to stay away from sweets. This fellow's desire for compliments isn't unique. Just yesterday, I read about a study conducted by scholars at Ohio State who determined that receiving boosts to their self-esteem was the thing that college students loved more than anything. The compliments of others can be addictive. Taking on a discipline for Lent (or at any other time of the year) can be a fine thing. But, Jesus says, if it’s all about getting compliments, we’ve got it wrong. The other night, Ann and I saw an interview on TV with an educated, middle clas Libyan man who had never before held a gun in his hand and, despite having so much to lose, had enlisted in the fight to bring down the dictator Moammar Gadhafi in his country. He said that, for him, it boiled down to a simple sentiment: “Ask not what your country can do for you, but what you can do for your country.” We who confess Jesus as our God and Savior belong to the Kingdom of God. Tonight, Jesus challenges us to set our egos aside, to ask not what our acts of religious devotion can do for us, but how our acts of religious devotion can make us more submissive to the will of God and how they can help us to tell the whole world the story of the God Who loves all so desperately that He became one of us, died for us, rose for us, and gives everlasting life to those who dare to put Him first in their lives. That’s the dare Christ lays before us this Lenten season, the dare He lays before us every day we live: Put Him first just as He did when He went to a cross for you two thousand years ago. Jesus characterizes His call to us in this way: “Seek first the kingdom of God and His righteousness.” Don’t ask what’s in it for you; just follow the God revealed in Jesus, whether anybody else notices it or likes it or not. May seeking God’s kingdom and the righteousness that belongs to followers of Jesus be our chief motivation this Lenten season…and our whole lives. Amen! My respect for Broder was boundless. The 2012 presidential election cycle will seem incomplete without his insightful, even-handed, fair reporting. His enthusiasm for the American political process is something we could use more of in this era of corrosive cynicism. Broder, of course, was not blind to the faults of our politicians or our political process. But he never seemed to have given way to the cynicism that infects so many who have spent decades covering the political activities of imperfect human beings. May God bless you with discomfort. Discomfort at easy answers, half truths, and superficial relationships, so that you may live deep within your heart. Amen. May God bless you with anger. Anger at injustice, oppression and exploitation of people, so that you may work for justice, freedom and peace. Amen. May God bless you with tears. Tears to shed for those who suffer from pain, rejection, starvation and war, so that you may reach out your hand to comfort them and turn their pain into joy. Amen. May God bless you with foolishness. Enough foolishness to believe that you can make a difference in this world, so that you can do what others claim cannot be done. Amen. Thanks to students at Seattle Pacific University and the folks at the relief organization World Vision, for sharing this. The work of World Vision inspires lots of people to be the blessings to others these Franciscan benedictions envision. Seven youth and three adults from our congregation, Saint Matthew Lutheran Church, participated in World Vision's 30 Hour Famine on February 25-26. They gave up food for thirty hours, raised money for world hunger relief, learned about the causes of hunger and what can be done about it, and shared some of their experiences with the congregation during worship on February 27. The youth set a modest goal of raising $150 through the famine and ended up raising $2055. Our congregation's young people have taught me that we are blessed in order to be blessings to others, a lesson I think anyone--wherever they are spiritually or politically--can embrace. Please do what you can for the poor, not just during Lent, but all through the year. For Christians, Jesus makes it clear that when we serve others, we serve Him. And I promise that it will make you feel good! The Gospel lesson for this coming Sunday, the first in Lent, is Matthew 4:1-11. God's Holy Spirit leads Jesus into the wilderness to be tempted by the devil. Then, the devil takes Jesus to the temple in the holy city of Jerusalem. That's sort of counter-intuitive, isn't it? There's nowhere you can be that's so removed from God that He can't reach you. There's no place so holy that the devil won't try rob those who go there of life and joy. The place in which you find yourself that you hate may be precisely the place you need to be to grow closer to God, stronger in your faith, finer in your character, more sure in your witness for Christ. The place you find so comforting because you're certain that God's people, God's power, and God's presence are palpable may be a place of grave spiritual danger where unnoticed temptations more easily trap you and steer you away from dependence on God. God can meet you (and help you) anywhere. Corrie ten-Boom, the Christian evangelist who, along with her father and sister, helped Jews escape the Nazi-occupied Netherlands and was later incarcerated in a prison camp for it, kept a daily prayer and worship appointment with God in the only place she could without being detected. It was the camp garbage dump and after a time, she said, it was the sweetest place she could imagine. God met her there. So long as we live in the wilderness of this sin-saturated world, evil will tempt and trail us. But if we invite the God we meet in Jesus to live with us, evil won't have the last word over our lives. Jesus has given a promise to all who trust in Him: "I am with you always, to the end of the age." He's still good for that promise...even when you feel you're in the wilderness. Lent emphasizes other aspects of Christian belief, most especially the need for total surrender to Christ so that the free gifts of forgiveness, eternal life, and purposeful living can be appropriated by those who turn from sin and believe in Christ. Of course, forty is an important number in the Bible. Jesus was tempted in the wilderness for forty days. The Old Testament book of Exodus says that God's people, the Hebrews, wandered in the wilderness for forty years. The rains that produced the great flood recorded in the book of Genesis lasted forty days and forty nights. So, it was natural that Lent would become a forty-day period. Ash Wednesday itself, say Pfatteicher and Messerli, features a mood of "penitence and reflection on the quality of our faith and life." The goal is to call believers to remember their mortality, dependence on God, and need to seek God's help in disciplining themselves to surrender every part of their lives to Christ. repentance, the joyful turning back to God. 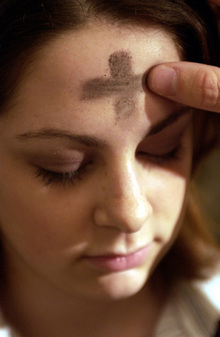 Ashes are also a symbol of cleansing and renewal. This makes sense when you think about it. When I was a boy and would lodge splinters into my hands, I'd go to my dad. Dad inspected things and soon, got a needle from my mom's sewing kit, and pulled out his lighter. He turned the tip of the needle in the flame of the lighter for maybe thirty seconds and after that, wave the needle through the air to cool it off. Then, he picked the splinter out of my hand. Of course, the reason that Dad ran the needle through the flame was to kill off any bacteria that might cause infection. Never Underestimate Our Common Enemy...and Never Underestimate the Power of Christ to Overcome! Glenna Salsbury has some great insights on dealing with our common enemy, Satan. Even the smallest acts of faithfulness to Christ can result in huge blessings. Satan tries to do his worst to you when things are going their best for you. If you're hit by unexpected adversities or blindsided by others' roadblocks, it may be a good sign that you're on the right path. The closer you are to the God we know in Jesus Christ, the more opposition the devil will throw your way. Job, whose story is recounted in the Old Testament, learned that the opposition of the devil and the condemnation even of those who he thought were his friends came because he was faithful to God. If you're a follower of Christ confronting adversities or hatred, as someone I know discussed experiencing with me recently, smile. You're on the right track! And remember, you're on the winning side of history. "In the world you face persecution," Jesus says to Christians, "But take courage; I have conquered the world!" The best prescription: Pray for yourself and, if someone is vexing you, pray for them too. Jesus says that believers in Him are to pray for their enemies. (For the Christian, an enemy is not someone we hate, but someone who hates us.) Then, keep following Christ. Why We Call God "Father"
I grew up in the city and because of that, believe it or not, I didn't see a sight that many of you may have seen many times in your life, until I was twenty-nine. It happened in Benzie County, Michigan, a place so small in population and size that it didn't even get its first traffic light until the late-80s. It's a place of real beauty with lakes and sand dunes that set next to Lake Michigan. Some people would say it's remote. Ann, Philip, and I spent a year there when I did my seminary internship. I'll never forget going to bed on the night we arrived, looking out the window, and seeing a shooting star flash across the sky. I'd had to get away from it all in order to see it, my first shooting star! Maybe that was why Jesus took Peter, James, and John to the top of a mountain, as we’re told about in today’s Gospel lesson. Jesus may have wanted to give these three key followers, the ones He had chosen to be the leaders of His Church, the chance to get away from it all so that they could catch a clear vision of Who He is. The account of what the three disciples saw that day also shows you and me Who Jesus can be for us. And, what Peter, James, and John saw was spectacular! While standing on top of a mountain, Jesus was “transfigured...and His face shone like the sun, and his clothes became dazzling white.” Then, two Old Testament figures showed up. One was Moses, the one to whom God had given the Ten Commandments and who had been Israel’s leader out of Egypt, through the wilderness, about 1500 years before the birth of Jesus. The other was Elijah, a prophet whose ministry began about 870 years before Jesus was born and came to an end when God sent a chariot to taxi him to heaven. The two of them represent the two great strains of Old Testament tradition: the law and the prophets. It was the Law and the Prophets that, hundreds of years before Jesus was born, pointed to His coming. Now, in a moment of fulfillment, Jesus stood talking with Moses and Elijah, underscoring that Jesus is the center of history and the bringer of all our best hopes. Peter and the others were understandably impressed by this sight! Peter was so impressed, in fact, that he spoke up, foot firmly in mouth as always, and said, “Lord, it is good for us to be here; if you wish, I will make three dwellings here, one for You, one for Moses, and one for Elijah.” That word translated as dwellings could mean everything from huts to temples. I think it’s safe to bet that Peter was thinking in grander terms at that moment. He wanted to build three religious shrines. This command to listen to Jesus would have hit Peter like a punch to the gut. Just six days before, Peter had confessed his belief that Jesus was the Son, or the very reflection, of God, on earth to be our Savior and King. Jesus applauded Peter's answer. But then He told Peter and the others that He was to be crucified in Jerusalem and rise again on the third day after His death. The very mention of Jesus being crucified had been repulsive to Peter. "This will never happen to You, Lord," Peter tried to tell Jesus. But Jesus, angered by this well-intentioned attempt to thwart Him in His mission of dying and rising for us, turned to Peter and said, "Get behind Me, Satan." "Listen," Jesus was telling Peter, "to what I'm saying; not what you want Me to say!" This past week, our son Philip sent along a quote from a theologian he'd run across. It addresses preachers of God's Word: "You are required to believe, to preach, and to teach what the Bible says is true, not what you want the Bible to say is true." Jesus was emphatic that He would be our Savior in the way God chose, not the way we might prefer. Now, on the mount of Transfiguration, after hearing the Voice from heaven command that he listen to Jesus, Peter may well have remembered the rebuke Jesus had issued to him six days earlier. Whatever was in his mind, Peter did the thing that made the most sense at that moment: He shut up and, along with the other two disciples, fell to the ground, understandably terrified. Jesus went to them, touched them, and told them, “Get up. Don’t be afraid.” As the three lifted themselves off the ground and tentatively looked up, they discovered that, Moses, Elijah, the cloud, and the dazzling brightness were all gone. Only Jesus remained. The same was true for those disciples as is true for us: When life frightens us or jolts us or throws us or hurts us, the only reliable helper guaranteed to be there is the compassionate God we know through Jesus Christ! So, what was the point of this incredible incident? There were many points, I suppose. But I want to zero in on just a few this morning. Point number one clearly was that Jesus is God the Son, in the flesh, come to earth with the full approval of God the Father. On the Mount of Transfiguration, He was revealed in the same way God was revealed on Mount Sinai to Moses and the elders of ancient Israel nearly fifteen centuries earlier. Point number two is seen in God’s implicit rejection of Peter’s proposal to build three shrines. Several years ago, Ann’s mom took her and her family to the Mediterranean. Among their stops were Rome and the Vatican. I was interested in Ann’s impressions of the Vatican, with its grand basilica and priceless works of art. Ann, you know was an Art major who formerly worked for the art museum and the Arts Council in Columbus and is a talented artist herself. I shouldn’t have been surprised by her reaction, but I was. Like almost every person I’ve ever known to go the Vatican, my wife said that she was totally turned off by all the money spent on a religious shrine and wondered whether God was really glorified by it all. It’s a good question. God isn’t necessarily glorified by buildings, icons, symbols, rituals, stained glass windows, or much-recited words. The Bible says that we followers of Jesus are temples of God's Holy Spirit, bought and paid for with the blood of Jesus Christ shed on the cross. In other places, it says that we’re to be living stones built on the cornerstone of Jesus Christ. Too often, our religious stuff may be nothing more than monuments to our own egos, designed to impress the world, not glorify God. But the God we know through Jesus Christ doesn’t build His kingdom with brick and mortar. He builds it in the lives of those who turn from sin and follow Jesus. That, I’m sure, is one reason that God cut Peter off when he offered to start building those three dwellings. A third point that I think the disciples were to take from their experience on the mountaintop is maybe the most important one. It can be seen in that simple, moving moment when Jesus approached the frightened disciples, touched them, and told them to get up and not be afraid. The God we meet in Jesus Christ wants us to let Him into our lives. He wants us to welcome Him into all that we say and do and are each day. Jesus can do wonderful things when we do that. When we let God into our lives, everything is different. We have a different relationship with God and so, we can build different relationships with those around us. We can face life with hope and openness. We live in the confidence that our sins, which would otherwise earn us eternal separation from God, have been forgiven and that God will help us resist temptation in this world and that in eternity, living directly in the presence of God, sin will have no more power to mar our characters or our lives. We can be like the backwoods Christian I’ve mentioned before who said, “I ain’t what I want to be and I ain’t what I’m gonna be. But I thank God, I ain’t what I was!” “If anyone is in Christ,” the New Testament tells us, “there is a new creation; everything old has passed away; see, everything has become new.” God wants us to let Him into our lives so that we can be made new. I could almost write a book about all the times I thought for sure my life was going to go bust. But each time that happens, I’ve learned the importance of letting the God we know through Jesus into my areas of deepest concern. When we do that, our burdens become lighter and He shows us what to do, if we only let Him. Lord Jesus, all day long, show me when I’m wrong. Affirm me when I’m right. Help me to make good decisions. Make me an agent of Your love. Today, I choose to let You into every moment of my life.